Several cellular processes, including adhesion, signaling and transcription, endocytosis, and membrane resealing, among others, involve conformational changes such as bending, vesiculation, and tubulation. These mechanisms generally involve membrane separation from the cytoskeleton as well as strong bending, for which the membrane chemical composition and physicochemical properties, often highly localized and dynamic, are key players. The mechanical role of the lipid membrane in force triggered (or sensing) mechanisms in cells is important, and understanding the lipid bilayers’ physical and mechanical properties is essential to comprehend their contribution to the overall membrane. Atomic force microscopy (AFM)-based experimental approaches have been to date very valuable to deepen into these aspects. As a stand-alone, high-resolution imaging technique and force transducer with the possibility to operate in aqueous environment, it defies most other surface instrumentation in ease of use, sensitivity and versatility. 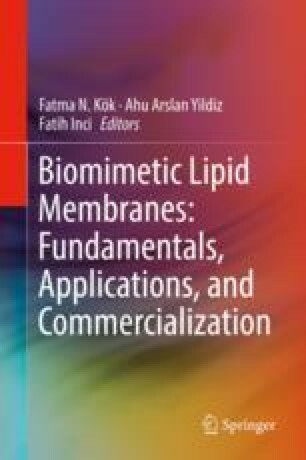 In this chapter, we introduce the different AFM-based methods to assess topological and nanomechanical information on model membranes, specifically to supported lipid bilayers (SLBs), including several examples ranging from pure phospholipid homogeneous bilayers to multicomponent and phase-separated SLBs, increasing the bilayer complexity, in the direction of mimicking biological membranes.